The Chinese architecture are the most influencing architecture in Asia. The role model for the cultural effects the civilization of the world regarding to development of design and art. Here, the profound treasury of ancient architecture is one of the important components which has a deeper comprehension of the oriental style philosophy of the so called “oneness of nature and man.” Islamic buildings in China including mosque, mausoleum are also known as li bai si (Building for a religious service). The Islamic believe it had been spread since the Tang Dynasty, in which the development of mosque and other religious place are more to the combination style between the Arabic and Chinese architecture style . As time passed, two major of categories of Chinese Islamic buildings are well preserved. Some of those of the ethnic Uygurs in Xinjiang maintained a more Arab style whereas the local building are mostly adopted a courtyard style with wooden as the materials for the building structure . This report will be discussing about Niujie mosque as one of a traditional islamic building located in China. 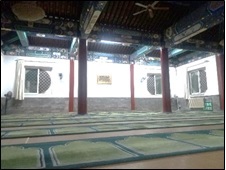 Niujie mosque is one of a prayer place for Moslem in the Capital city of Beijing. 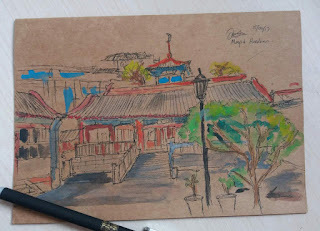 The architecture represents the style of some mosque made in the mainland of China. The magnificent Niujie Mosque of Khan-Baliq (present day Beijing) is a great example for the spread of moslem in China. It was established by an Arabian scholar Nasir al-Din who served as an official in the Liao Dynasty (907-1125). Two Arabs who came to China during the Yuan Dynasty (1279-1368) and served as Imams now rest beside the Mosque where their tomb stones can be seen today. Proof of commitment to this graceful land continues today by the bearers of this religion. . Among more than 60 mosques in Beijing, the Niujie Mosque is the oldest, largest and most populer in the Mainland of China. The ground area including the eastern temple section and women’s mosque district which the area exceed to 9,200 square meters. 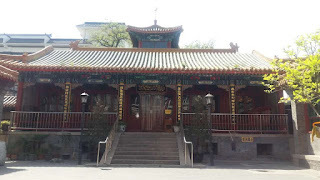 It is said that the Niujie Mosque was first constructed in 996, or in 14th of Century during the reign of Tonghe (Liao dynasty), by an envoy from Arabia, Nasrettin . Even if the scale might have been much smaller, it could have been made in the architectural style of the Middle East like the Shengyou Mosque in Quanzhou. 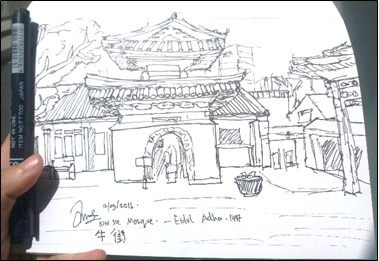 Based on the figure of live sketch by the author, it is shown that the three different kind of mosque has a same style of architecture. The colors are dominantly between brown, red, blue, and green. The style of the roof and design will look a like each other even with different layout and size. Most of them has a shape of pagoda roof with just two to three layers above. The column itself contains of pillars with wooden furnishing design with similar color of styles and calligraphy motifs. An important feature in Chinese architecture is its emphasis on symmetry, which connotes a sense of grand and ancient space. This applies to everything from palaces to mosques, so it will look similar if people look at it generally. 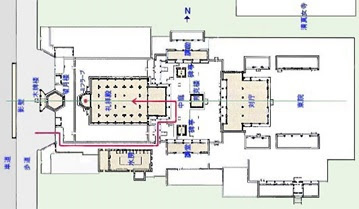 In the center, the Hall of worship and the Rear Mihrab Hall where Muslims would pray together and gather for the religious faith can be found especially in Niujie. This also symbolize the qiblah which is the center point that represents where to face the pray to God. Niujie mosque as one of the oldest mosque in China plays a crucial role as while the mosque is located in the capital city of China, Beijing. 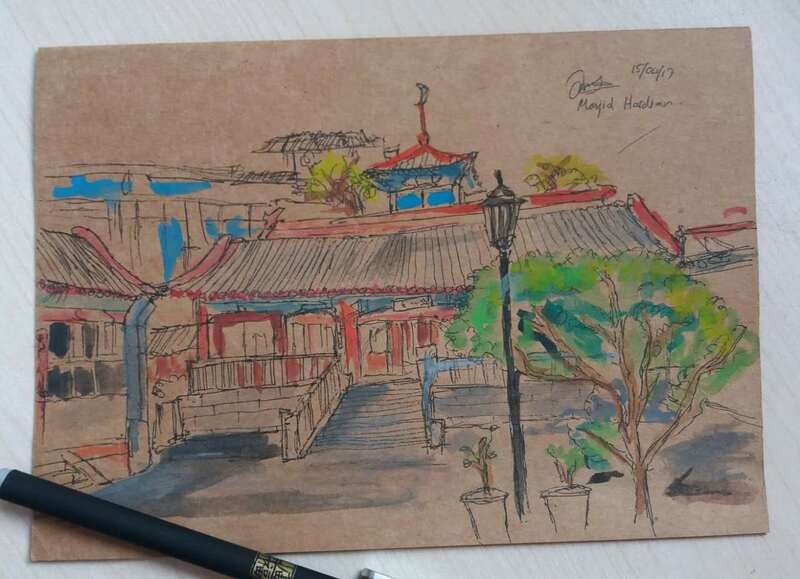 With a dominantly wooden structure, prayer hall, and red, blue, green color style, it represents the Chinese Islamic ancient architectures with similar styles of the ancient Chinese architecture. Chen Ying. 2017. 4rd Lecture notes of . A brief Introduction to Chinese Culture: Chinese Art Forms. Beijing Jiaotong University. 2017. 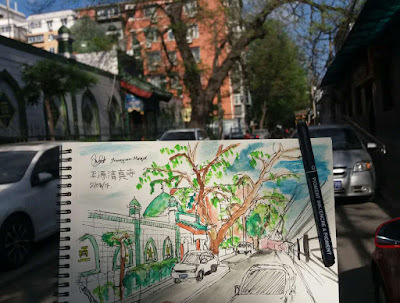 Sun Dazhang, Qiu Yulan. The excellence of Ancient Chinese Architecture, Islamic Buildings: Islamic Mosques in Various Regions of China. China Architecture & Building Press. Beijing: 2016. Khamouch, Mohammed et. Al. Jewel of Chinese Muslims Heritage. Foundation of Science Technology and Civilization. 2005. http://www.muslimheritage.com/uploads/China%201.pdf accessed on 18th of April 2017, 11.30 PM. Qiu, yulan. Islamic Buildings (Ancient Chinese Architecture. Springer Vienna Architecture: 2003. Islamic Architecture in Northern China. http://www.ne.jp/asahi/arc/ind/6_china/northern/nor_eng.htm accessed on 24th of April 2017, 13.30 PM.